The modern college building has been designed to create an undisturbed, inspirational, reassuring and stimulating learning environment for our pupils. The Assembly Hall, acting almost as a courtyard, affords pupils the opportunity to see across from one side of the building to the other. Vision panels afford pupils views from the Sports Hall from high and low levels. Glazed stairwells afford views to the landscaped grounds and the surrounding countryside. Roof glazing allows sunlight to penetrate open spaces inside the building at every opportunity. Colour is used as a kind of coding device throughout the inside of the building purely as a form of visual communication to assist navigation around the building. Each subject suite has an associated colour which is used on each classroom door, internal feature wall, floor covering and fitted units. 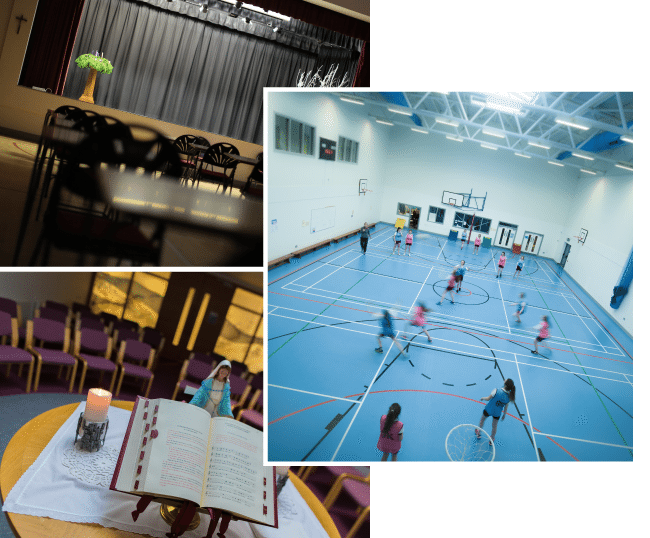 The layout of the building has been deliberately kept as simple as possible so as to convey the school as a large house, in which each pupil is part of a special school community family. The large volume spaces – Assembly Hall and Sports Hall – are located at the centre of the building, with the teaching classrooms grouped around them on either side. The library and administration areas are positioned at the prow of the building, overlooking the landscaped grounds below. The school meals accommodation reaches out as an arm of the college building onto a terrace adjacent to the main entrance. The Oratory, both physically and spiritually is located at the heart of the building. Extensive outdoor playing facilities include tennis courts, an all-weather pitch and a grass playing field.